This, appropriately, looks like a story set in the Minnesota Charles Schulz grew up in. As is the case with the other specials, the setting is very snowy. Everywhere we see snow-covered landscapes; what is normal in this world is looking out to see snow! This might be most notable when we see when Charlie Brown walk home past snowy fields; the stark combination of black sky and white fields projects peacef and calm. Particularly striking is the joy characters demonstrate when interacting with snow. Snow falls during the opening as they skate on ice; it falls at the end while they sing. (Falling snow looks great on the screen… and not bad on this blog, during mid-winter 🙂 For love of early snow! Lucy leads a debate over the flavor of snowflakes which they catch on their tongues. And Snoopy expresses great delight in outdoor recreation during the opening frozen pond scene. Continually, we are reminded that this is a setting where characters experience snow, and enjoy themselves out in the winter weather. Pop culture commentary is in love with ‘-verses’ now, so I will coin this phrase! The Rudolph-verse is the world in which a series of Rankin-Bass stop-motion Christmas Specials take place. “Rudolph the Red-Nosed Reindeer,” “Santa Claus is Coming to Town” both largely take place in a snow-covered North; “A Year without a Santa Claus” is based, I think, in the same fictional universe, although the action takes place in a broader range of locations. The world of ‘the North Pole’ in these specials looks more like the Northern contiguous U.S. than the actual Arctic ice mass. This is not a land of flat expanses of ice; nor does it look like tundra or taiga. (This is no “Atanarjuat.”) So these specials add an aura of Christmas magic to the landscapes many Americans could experience during winter. Travel in this snowy and icy world is central to the plot. Kris Kringle in “Santa Claus” must navigate the Mountains of the Whispering Winds in order to move from his idyllic frozen home valley to the town where he delivers toys; later, he and his family flee to the North Pole. 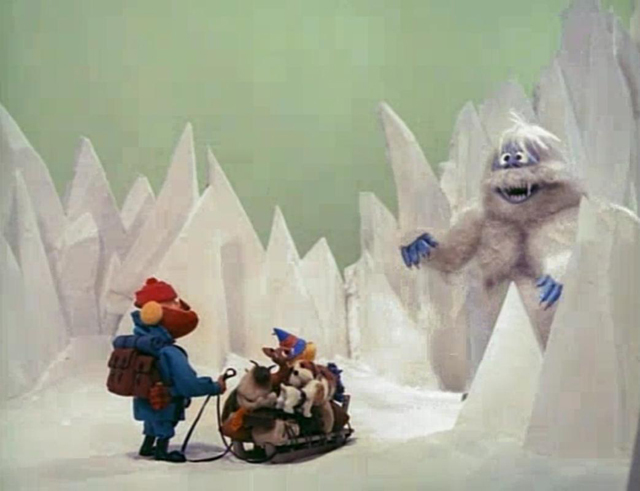 The entire action of “Rudolph,” from the North Pole to the Island of Misfit Toys to the locations of Rudolph’s wanderings, is covered by snow and/or and ice (or open sea between frozen locations). Many stories about the Arctic polar region (polar exploration narratives, efforts to seek the Northwest Passage) depict the landscape as an icy challenge, the primary adversary of those who travel here. (See Arctic Dreams by Barry Lopez for an introduction to such stories.) That is not at all the case here. Instead, the characters do not seem affected by the cold – that’s the case for elves, Santa, reindeer, and a prospector. Also, there are literal snow-creatures. It’s not realistic, no – but wow, if you want something that encourages people to just go and out and experience the outdoors during winter, without the cold intimidating them, this is as good as it gets! This tendency goes furthest in the depictions of actual creatures of snow. “Rudolph” includes both a talking snowman, and a snowmonster (which I… don’t think is made out of snow, but that’s what it is called). 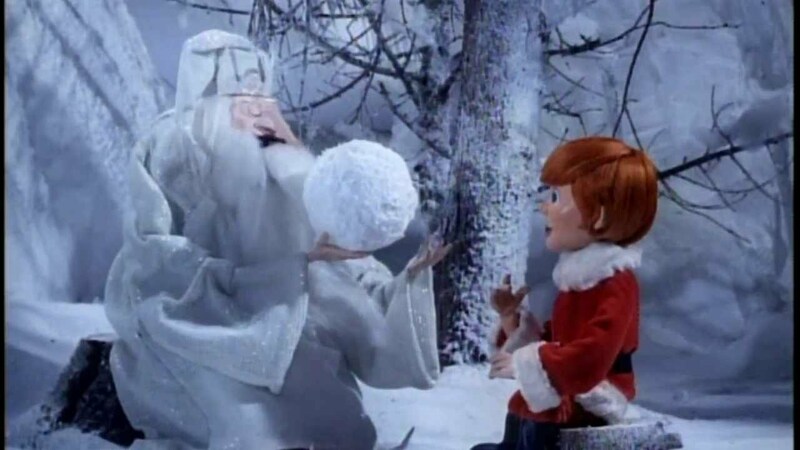 Other specials depict two figures with significant snow-related magic: the Winter Warlock, and the Snow Miser. 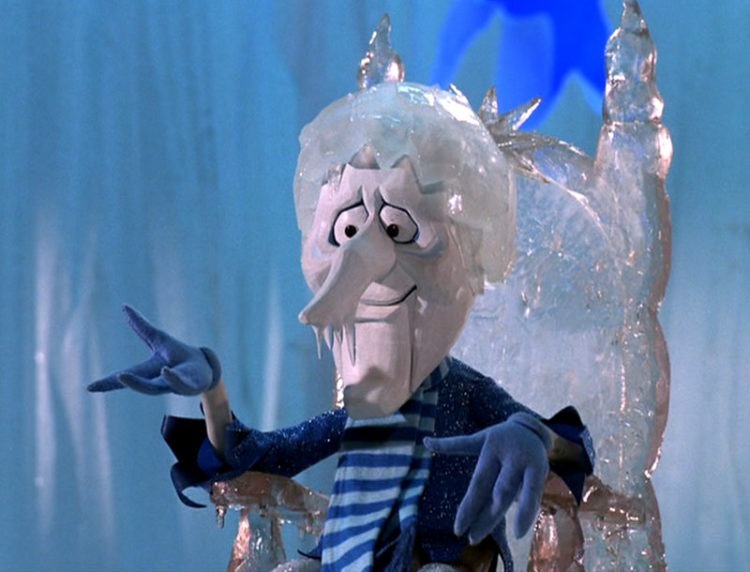 (Snow Miser, note, not Cold Miser, as the contrast would suggest.) So not only are these characters comfortable with snow, they have a special bond with it; their powers allow them to transform it, and/or to use it to transform the world. Another series of specials revolves around a literal snowperson too, of course. “Frosty” is all about celebrating snow – the kids are eager to play in it, then they do play, and they make a snowman out of it. The oft-repeated lead song pays tribute to a person made out of snow. We are led to feel excited when water freezes, and sad and worried when it melts. The special provides a message about celebrating snow, impermanent as it is, while we have it to appreciate. Again, even when action moves northward, we see forests – not tundras or ice sheets. 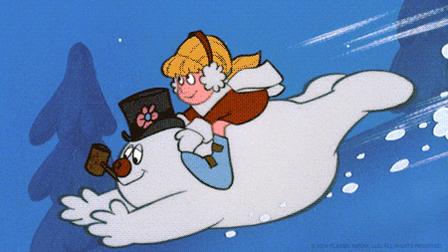 Frosty is able to use these landscapes – and his snowiness – to escape, in one key scene. Throughout these specials, these characters don’t stop to complain about snow. They treat it as normal. They go outside and do what they need to do; they live, work, and play on the snow. The children go out and delight in playing in the snow. Other characters can go beyond that, due to having snow as part of their essence. 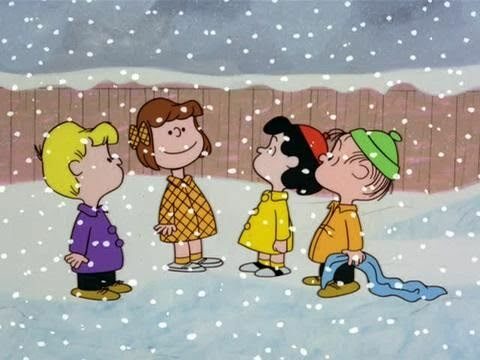 We can’t do that – but perhaps we can reclaim some of the sense of magic, and joy, in snow which we experienced while watching these specials when we were young! This entry was posted in Reflections, Winter in Popular Culture. Bookmark the permalink.